The Pinkerton Family of New York, Iowa, and Michigan chronicles the available historical records for James Pinkerton, who emigrated from England in the 1750s and settled in Bedford, Westchester County, New York. James and his family were the only known Pinkerton residents of colonial New York, and they do not appear to have been related to any other early American Pinkertons. The book then follows up to eight generations of his descendants, primarily along the Pinkerton line, who moved into Central and Western New York and then to Iowa and Michigan during the 1800s. Many family members still reside in those states, but their relatives have long since dispersed widely across the country. &#x201c;Celebrity&#x201d; ancestors for this family include Reynold Bush, immigrant ancestor of the U. S. Presidents Bush, and Henry Spencer, common ancestor with Diana Spencer, Princess of Wales. Many in the family are also descendants of George Soule, Mayflower passenger and tutor to the children of Governor Edward Winslow, and Sarah Jorissy Rapalje, the first European born in New Netherlands. 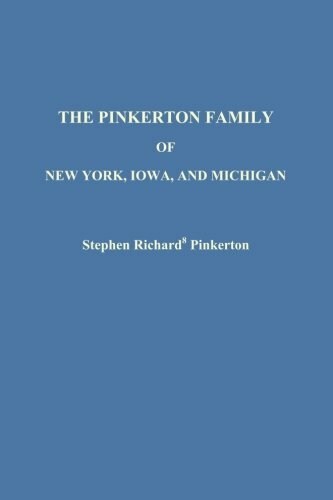 Pinkerton ancestors include William Pinkerton, who worked in the foundry that made canons for &#x201c;Old Ironsides&#x201d;; Jacob Pinkerton, manufacturer of a patent medicine called &#x201c;Pinkerton&#x2019;s Wahoo&#x201d;; and the five generations of Pinkertons who built and owned railroads along the Huron Lake shore in Michigan. Significant allied families include Carr, Coleman, Houghtaling, McCallum, and Wheat. Stephen Pinkerton is a family history detective based in the Boston area. He may be contacted through his publisher Pontchardon Press.